Bespoke & Wheel: ...and so it begins. Dallas is finally getting it's bike lanes! Just last night, on my way home from the studio, I noticed this brand new bike lane thingy (technical term). I'm not sure exactly when they were put down, but I'm pretty sure it was while I was in the office working. They're popping up all over the place, and hopefully, one day, you could start and finish your journey in a bike lane. For now, you must settle for small stretches that pop up out of nowhere and then randomly end almost as soon as the've started. 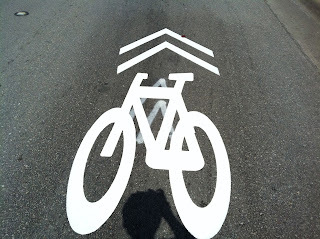 I'd like to suggest that we take a cue from Portland Oregon's street striping crew and get a little creative with the "Bike Guys" as they like to call them. But it's a start, and it does feel a little less dangerous to ride your bike when there's a big white shiny bike lane thingy on the road. Now, granted, they are shared lanes, which really just means, "Hey! Look out for bikes!" But what it means for us cyclists is something more than that. It says we have the right to ride our bikes in the street. It's been true all along. It's the law. In fact, it's illegal to ride your bicycle on the sidewalk. But for some strange reason, a lot of people in Dallas are completely unaware of this. Even friends and family will look at me like I'm a total idiot when I tell them I ride my bicycle on the streets. It is dangerous, no doubt. But I'm really not sure that it's more dangerous than hurling down a four lane freeway at 75 mph in a 2000 pound metal can, surrounded by hundreds of other people of varying degrees of competence, doing exactly the same thing. Even more scary, hurling down a two lane road in the middle of nowhere going any speed, separated by nothing but a 3 inch strip of paint from countless unidentified people doing the same thing, but in the opposite direction! Seriously! That's freaking scary! This, however, has proven to be a totally socially acceptable way to take your life into your own hands. Enough with the sermonizing! Go ride your bike already! It's better than spinning class or bobbing up and down on some bazillion dollar machine watching television. It's mostly free (once you've got a bike). It's a hell of a lot cheaper than driving! And you'll feel better about yourself, and the city you live in.